The Bigg's Brownie is a species of butterfly that belong to the subfamily Miletinae. The caterpillars are considered "carnivorous" as they feed on other insects - primarily coccids, mealy bugs, aphids or ant larvae. 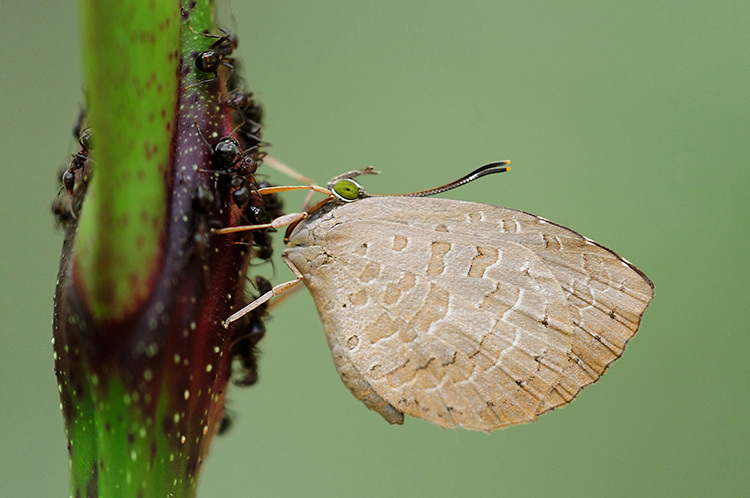 The early stages of this butterfly also have a symbiotic relationship with ants. The caterpillars get protection from the ants in return for sweet secretions often referred to as "honeydew" from their bodies. The Bigg's Brownie is often seen in the vicinity of ants like shown in this shot. As the ants are known to "farm" the aphids, mealy bugs and coccids for their secretions, the butterfly seeks out these locations to lay her eggs so that the caterpillars can feed on the aphids. This shot was taken by ButterflyCircle member Mark Wong in the forested nature reserves recently.